Profit Track 100 ranks the top 100 most profitable privately owned businesses from around the UK selected across a diverse range of industries. Being featured as ‘Ones to Watch’ as a hospitality business is a fantastic achievement and shows that our hard work is being recognised within the industry. It’s been a strong financial year FY19 for Beds and Bars with a 7.8% rise year on year. Turnover increased to £52.5M with EBITDA of £6M, 25% ahead of last year. We have big plans in 2019 including opening two more hostels in Europe as well as continuing to invest in our current estate. We are also actively seeking out properties in other major European cities. 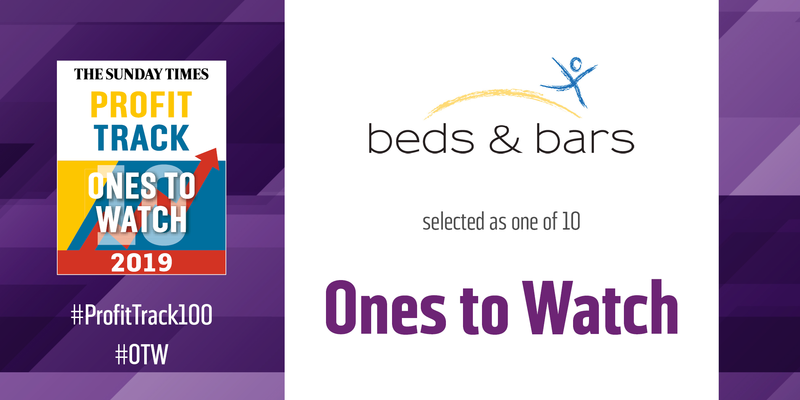 The “Ones to Watch” Sunday Times BDO Profit Track 100 has been published in the Business section of the Sunday Times, on the Sunday Times tablet edition, and on its website. Beds and Bars achieved IIP Platinum status in 2016. Today, the ever-growing company under Keith Knowles operates 21 backpacker hostels, bars and pubs across Europe spanning 13 cities and 9 countries. St Christopher’s Inns, Belushi’s and The Flying Pig are just some of the well-known brands within the company. As a result, Beds & Bars has been in the Sunday Times Top 100 fastest growing companies in the UK. The company was born in Hammersmith in West London in 1964 by Keith’s father, where the family owned pubs in the area in the 60s.